The field of particle physics has been going through a bit of soul-searching of late. There was jubilation when the Higgs boson particle was detected at the Large Hadron Collider (LHC) in 2012. But since then, the major new discoveries in physics that the LHC was predicted to make have failed to materialise. So there has been a considerable buzz around a report that the MiniBooNE experiment at Fermilab in the US may have found hints of a new particle. 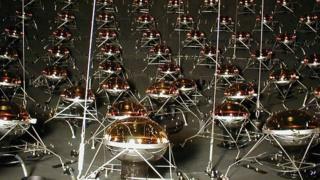 Specifically, the data may hint at a previously undetected form of neutrino, known as a "sterile neutrino". Neutrinos are among the most intriguing residents of the "zoo" of particles known as the Standard Model (SM). The SM is the most successful theory to explain how the world around us works, yet it has limitations because it does not explain phenomena such as dark matter, or gravity. Neutrinos interact only very weakly with other elementary particles, which has led to them being nicknamed "ghost particles". They also have the ability to "oscillate" - flip, or switch identity - between three different forms, or flavours. These are the electron neutrino, the muon neutrino and the tau neutrino. A fourth flavour, the sterile neutrino, has been proposed before, but has never been detected by experiments. The existing three flavours of neutrino would interact with matter through the weak force (one of the four fundamental forces of the Universe) and gravity. The sterile neutrino, however, would primarily interact with gravity. However, one that's detectable with instruments would have to mix with the other (active) neutrino flavours to some degree. "If the sterile neutrinos were completely decoupled from the active neutrinos, they would be impossible to see," says Prof Stefan Söldner-Rembold, head of the Particle Physics Group at the University of Manchester. The sterile neutrino is important because it would represent new physics beyond the Standard Model, and must have played a role in the formation of the Universe, potentially affecting our models of cosmology. In fact, says Prof Ray Jayawardhana, an astrophysicist at York University in Toronto, Canada, "one of the reasons for people to propose sterile neutrinos in the first place was that they might explain dark matter in the Universe, because you would see the gravitational influence, but they wouldn't interact any other way." MiniBooNE can detect the traces of electron neutrinos interacting with atomic nuclei in a spherical tank of mineral oil located at Fermilab in Illinois. The neutrinos themselves are generated by firing protons at a target made of beryllium. These muon neutrinos then travel underground to a detector. On the way, some may flip to the electron neutrino form. Scientists working on the MiniBooNE project have published data from its 15-year run, showing many more electron neutrinos being detected than would be expected under the Standard Model. The findings appear in a paper on the Arxiv pre-print server and are to be presented on Friday at the Neutrino 2018 conference in Heidelberg, Germany. The implication of the paper is that some of the muon neutrinos are flipping to sterile neutrinos before switching identity again to electron neutrinos. The researchers see this at the confidence level of 4.8 sigma (5 sigma is the usual threshold for claiming a discovery) at MiniBooNE. When combined with a similar result more than 20 years ago from the US Liquid Scintillator Neutrino Detector (LSND) experiment, the significance exceeds six sigma. Prof Söldner-Rembold said that most physicists expect additional new neutrinos to be very heavy particles. But this one - if it really exists - would be relatively light. But there are potential problems for the sterile neutrino interpretation: results from other neutrino experiments, such as IceCube and Minos, show no evidence for a particle of this kind. In addition, other scientific teams later failed to replicate the result from the LSND experiment. More evidence against the idea comes from the Cosmic Microwave Background - the "afterglow" of the Big Bang - as measured by the Planck spacecraft. A study from 2016, authored by Prof Söldner-Rembold and other scientists from the University of Manchester confirmed that a sterile neutrino is not needed to describe the CMB measurements. Furthermore, the authors of the MiniBooNE paper could be underestimating the "background". This refers to other events in the data which aren't related to the signal physicists are looking for - false positives in other words. Neutral forms of a particle known as the pion can decay into photons (particles of light), which could be mistaken for electrons: "A photon would look very similar," says Prof Söldner-Rembold. However, another neutrino experiment at Fermilab, called MicroBooNE, uses a different technology to MiniBooNE - liquid argon - which can distinguish between photons and electrons. This experiment will be vital for checking the recent results. Prof Jayawardhana calls the result "intriguing", but explains: "Ultimately, we need independent results from different experiments because different experiments would be affected by different systematics... if you can validate the results then that adds to the confidence levels overall." Prof Söldner-Rembold adds: "There could be other interpretations, such as the background. People in MiniBooNE realise that; publishing this was exactly the right thing to do." "The statistics are clear, but it's the interpretation that's open. That makes it exciting... time will tell." Prof Jayawardhana echoed this view: "The statistical significance you can assign a value to, if you think you understand what the other particle backgrounds are... but if you're not able to account for that background very well, it complicates matters," he says, "That's the way science is." Regarding the idea of the sterile neutrino as a dark matter candidate, if the excess of electron neutrinos seen by MiniBooNE does represent a particle, it would be too light to be compatible with dark matter. However, the search for the dark stuff, which makes up 26.8% of the cosmos, and 80% of all matter in the Universe, continues apace. Xenon 1T, based at the Gran Sasso underground lab in Italy, is the most sensitive experiment for the direct detection of dark matter particles. The team recently announced the results of a year's worth of data, placing much more stringent limits on the space where dark matter particles could be hiding. The researchers did detect a very small excess of events, at the statistical level known as one sigma. But this "signal" is currently too weak to get excited about and may yet disappear.